Remove stains now and repel them in the future. SONAX Leather Foam is a technologically advanced leather cleaner and conditioner for all automotive leathers. 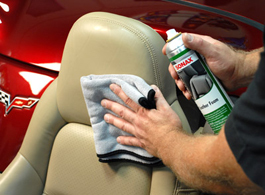 SONAX Leather Foam is formulated to gently remove dirt, stains and oil from leather seats and interior fittings. 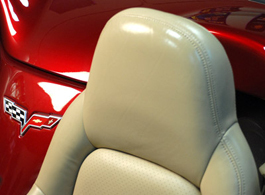 The foaming action makes this product safe for vehicles with heated and/or cooled seats and will not absorb into the perforations of the leather. SONAX Leather Foam contains modified Beeswax, one of the best known ingredients for conditioning leather. Beeswax leaves leather soft without a greasy residue - more like the texture of new leather. Sink into a soft leather driver's seat that looks and feels the way leather was meant to feel. 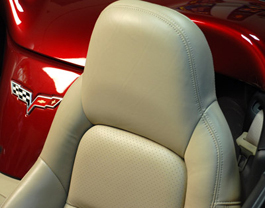 SONAX Leather Foam contains no dyes, harsh chemicals or silicone, making this product ideal for any color leather. The foam safely removes stains without removing color from vat-dyed or surface-dyed leathers. This foaming leather cleaner and conditioner lifts and removes soil without drying out the leather’s natural fibers. The low moisture foam doesn’t soak the leather; it safely lifts dirt and oils to the surface of the leather where they can be easily wiped away. Leather that becomes very wet and then dries loses its softness. That's why SONAX has taken the care to formulate a Leather Foam that cleans without saturating the leather. SONAX Leather Foam provides long-lasting leather protection plus a low-gloss, natural-looking finish that feels clean to the touch. Spray SONAX Leather Foam onto a clean, dry microfiber towel. Spraying the towel will prevent overspray inside the vehicle. Wipe over the leather seat, agitating dirty areas. Flip the towel and buff dry. Above is a bare, untreated leather seat. Spray SONAX Leather Foam onto a clean, dry microfiber towel. Wipe the leather, agitating dirty areas. Flip the towel and buff the seat dry. 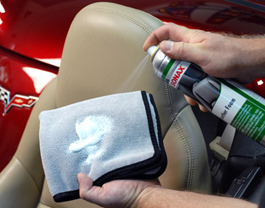 SONAX Leather Foam is a one-step, quick solution to complete leather care. Designed for today’s luxury vehicles, SONAX Leather Foam safely cleans and conditions heated or cooled seats and perforated leather. I have tried EVERYTHING and this is the best!! If you put a little time in buffing it after you apply it, it will show. Leaves my two tone (black/brown) leather like new everytime!! Leaves it soft and not too shiny but just enough to look great. I will never buy another brand ever!